OpenQuest Basics- Revised with Full Colour art! A Message from Furthermost – A River of Heaven Scenario by John Ossoway. The Clockwork Palace – Any OpenQuest Adventure Location, with new cult, magic, creatures, personalities and scenario seeds, by Paul Mitchener. At the edge of the city stands the Clockwork Palace, a huge building made not of stone but of brass. Over a mile long, it is an intricate mechanism of clocks, levers, hydraulics, and only the clockwork god knows what else. The uses of some parts of the mechanism are obvious. Clocks are everywhere within the palace, mechanical men guard the automatic doors, and an orrery (a mechanical model of the planetary system) dominates the main entrance lobby. But even those who live there, the Clockmakers, know few of the Palace’s ancient secrets. Nor do they know its original function. Was it a temple to a mechanical god? Was it itself a god? Did the Clockmakers once build the Palace, or did they move there, before even their accurate records began? This short supplement for OpenQuest details the Clockwork Palace, its mechanical magic, the Clockmakers, and half a dozen adventure outlines linked to the palace. You can use it in any OpenQuest fantasy game where such a part mechanical, part magical wonder fits in. Praise Kane the First of Us, Praise the Guilds. Your team has been assembled by Father Francisco of Special Circumstances. The Guild Council has ordered a live team to investigate the loss of contact with the Guildship Tannhäuser. No one has dared attack a Guild Stepship in centuries. Special Circumstances are taking no chances. You go in, you establish what has happened, you recover the crew and as much data as possible. You’ll be operating on your own and there will be no reinforcements. 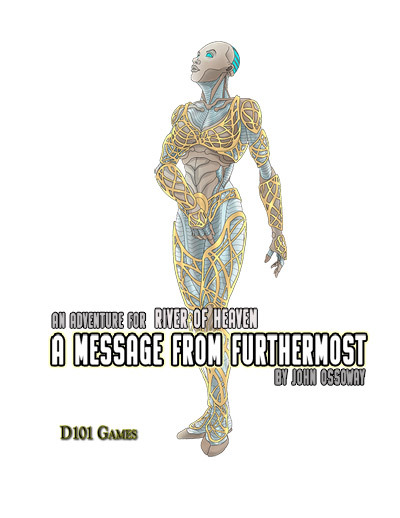 A Message from Furthermost is an adventure for River of Heaven Science Fiction Roleplaying Game. It is self-contained, and comes with six pregenerated characters if you want to pick it up and play. It can also easily dropped into an existing campaign.